Asaf Avidan (born 1980) is an Israeli singer-songwriter and musician. 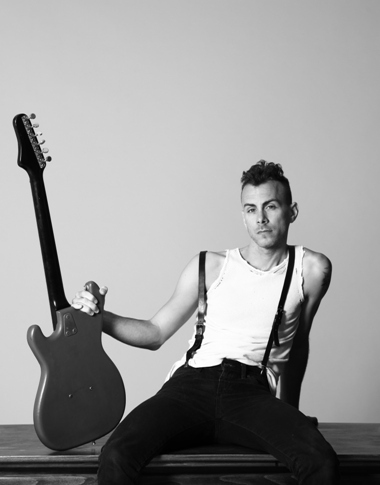 He is also the creative force and front-man of folk/rock band Asaf Avidan & the Mojos. Avidan’s voice is perhaps his most known attribute. It has drawn comparisons worldwide to Janis Joplin, Robert Plant and Jeff Buckley and has garnered quotes such as "a new Messiah" by Rolling Stone Mexico, as well as "a hoarse angel", a "force of nature" and "the lovechild of Dylan & Joplin". Avidan was born in Jerusalem, Israel in 1980. His parents were diplomats for the Israeli Foreign Office and he spent four years of his childhood in Jamaica. After the mandatory army service in Israel, Avidan studied animation at Jerusalem’s Bezalel Academy of Arts & Design. His final project short film, “Find Love Now”, won its category at the Haifa Film Festival that year. After his studies, Avidan moved to Tel Aviv and worked as an animator, until a breakup with his long-time girlfriend shook his world and made him move back to Jerusalem, quit his job and turn full time to his up-till-then hobby – music. Six songs about that breakup and subsequent heartache would constitute his debut EP, “Now That You’re Leaving”, which was released independently in 2006 to critical acclaim. In late 2006, while playing solo shows across Israel, Avidan put together a support cast of musicians who would become The Mojos (Ran Nir – Bass ,Yoni Sheleg – Drums, Roi Peled – Guitar, Hadas Kleinman – cello). The group played extensively in Israel, and also played a few New York shows, including MEANY Fest, where they advanced to the finals. In 2007 the band went into the recording studio together for the first time, and recorded “The Reckoning”. The album’s 15 tracks blended rock, folk and blues with honest and heartfelt lyrics about relationships and betrayal. By now the band had accumulated a huge live following in Israel and most record labels expressed interest. But Avidan (with his brother and manager, Roie Avidan) decided to continue on the independent path, and founded Telmavar Records, on which “The Reckoning” was released in March 2008. It reached Gold status in a year, platinum later, and would become the biggest selling independent record of all time in Israel. It was chosen as Album of the Year (2008) by various medias, including TimeOut Tel Aviv. “Weak”, the second single off the album, became a huge radio hit and its video was Video of the Year on Israel’s music channel. “Weak” would also be the title song of the film "L'Arbre" by Julie Bertuccelli, starring Charlotte Gainsbourg, and the closing film at Cannes Film Festival 2010.While several European labels put offers on the table, the band opted to embark on a self-funded summer tour in 2009, playing dozens of festivals and venues across Europe. By the end of that summer, Telmavar Records signed a licensing deal with Sony-Columbia in Europe, for "The Reckoning" and for the band's future second LP.The Reckoning was released in parts of Europe in 2009, to generally excellent reviews. In France iTunes chart it would peek at #8.
leaving it up to the audience to decide whether this figure was poor or lucky. It would reach Gold status in 5 months, and garner ecstatic reviews. It was released in parts of Europe in April 2011. Among others, it was album of the month at France's national FIP radio and the newspaper Liberacion, and Germany's Eclipsed magazine.The band continued to tour non-stop from 2009 all through 2011 (mostly in Israel and Europe but also in the US, Canada, China and India), building up a devoted following and a reputation for a legendary live show. Amongst the hundreds of shows, they played at Brandenburg Bridge at The World Championship of Athletics in Berlin; at the closing event at Cannes Film Festival 2010, at China’s biggest May 1st festivals; at a tribute concert for The Who in Carnegie Hall, New York. They would play dozens of festivals across Europe (to name a few: Solidays France, Latitude UK, Paleo Switzerland, Frequency Austria, Haldern Pop Germany) as well as countless radio and tv shows (including Taratata and One Shot Not in France, and two Rockpalast performances in Germany).On November 30, 2010 the band released their 3rd album in Israel, "Through the Gale", a concept album telling the tale of a blind and stubborn voyage of a captain and his loyal crew in search of immortality, to the realms of the gods themselves, only to understand at the end that a voyage with no home, that a life without death, are meaningless. In July 2011, following another summer tour that saw them sharing the stage with Robert Plant, Ben Harper and Lou Reed among others, Asaf Avidan & the Mojos announced that they are taking an indefinite creative break. Avidan had continuously played solo and duo acoustic shows throughout the band's career, including "regular" venue shows as well as a TED Global conferece performance, supporting Bob Dylan, playing a tribute concert for The Who at Carnegie Hall and many radio and tv performances. Avidan is set to continue touring and recently finished recording his first solo album with producer Tamir Muskat (Balkan Beat Box) the new album is set to be released in early 2013 with Polydor / Universal.